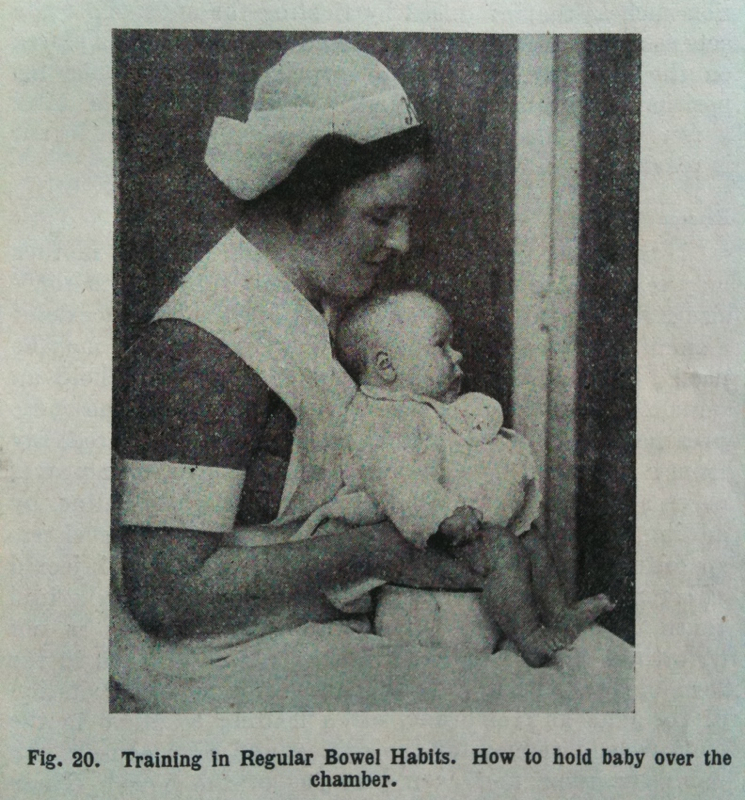 We went to visit my wife’s grand-mother at the weekend (103, age fans) and found a real treat on her bookshelves – Feeding and Care of Baby by Sir Frederic Truby King. It was first published in 1913 but my Grandmother-in-law’s edition was printed in 1942. I would imagine that it has survived the intervening decades in her house not as a source of timeless wisdom and advice but as an object of pure ridicule. If I’d had time, I would have photographed every single page. I just managed to nab some highlights. Apologies for the crappy picture quality. Sir Frederic recalls a hilarious jape. The author. We can see at once that we’re dealing with a man who’s high on life and keen to pass on the deep sense of wonder he feels every day as he beholds creation. Look at him! Look at his sense of wonder! He looks like he’s just been told that his cancer has got cancer. Many new parents find it difficult to establish a routine with their infants but Sir Frederic has them covered. This simple guide divides baby’s day up into handy segments labelled ‘Sleep’, ‘Sleep and Exercise’, and ‘Sleep, Exercise and Bath’, with regular breaks for ‘Food’, ‘Wash’ and ‘Bath’. Now you may think that a) there’s some repetition here and b) this scheme takes no account of reality here on planet Earth, but that’s because you’re an idiot. You probably didn’t have enough sleep, exercise and baths as a child. 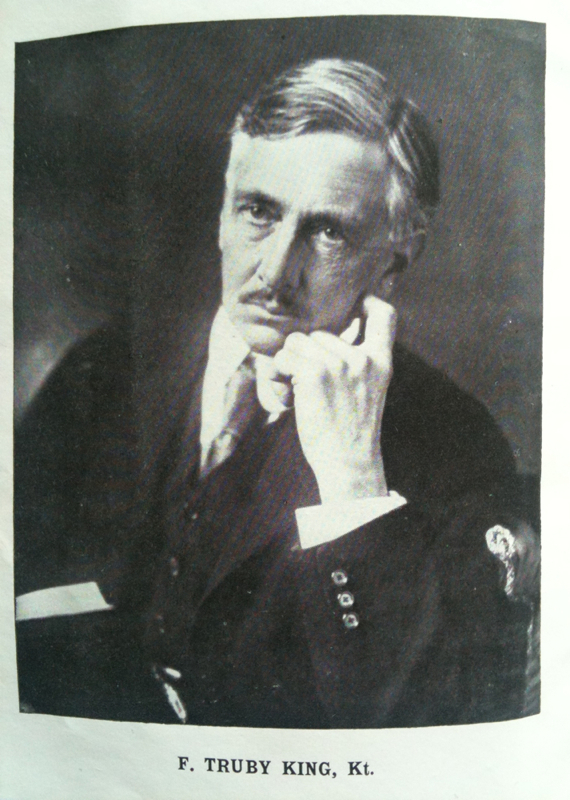 It quickly becomes apparent, as you turn the pages, that Sir Frederic is great believer in three things: discipline, routine and the balancing of infants in precarious positions. This happy little chappie is being weighed like a sack of grain, blissfully unaware that one over-zealous giggle will send him flailing to his death on the cold stone floor. Note the several feet of thin air available for him to fall into. Note also that there are no adults within grabbing distance. If you tried to film this for a movie, you wouldn’t be able to get insurance. More balancing here, this time on ‘the chamber’. 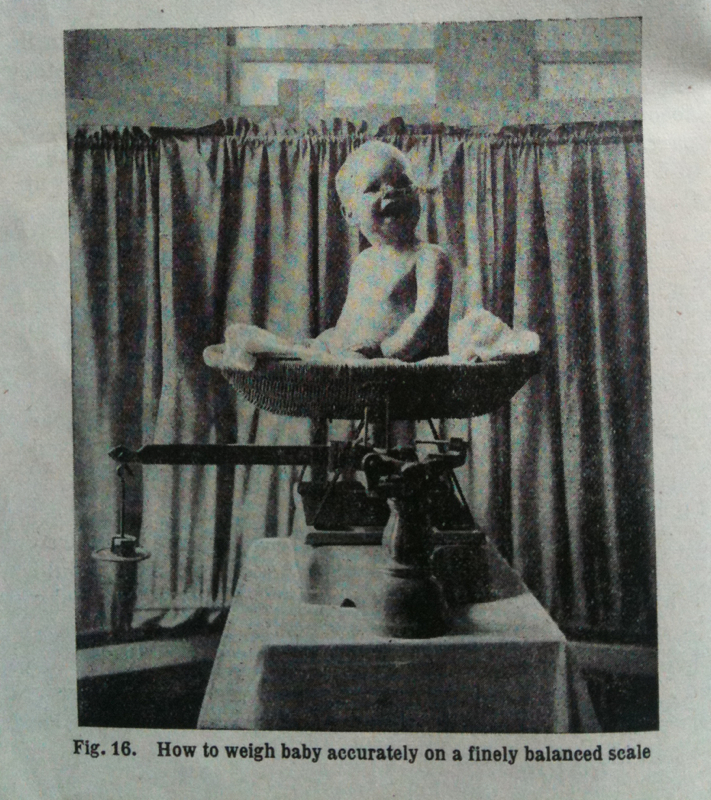 This baby has an advantage over his colleague on the weighing scales inasmuch as he has the assistance of a nurse to keep him more or less upright. On the other hand, given the weighing scales farrago, it’s easy to imagine that she herself is perched on a lofty bar-stool that sits in turn atop a piano or perhaps a billiard table. And she is awfully close to the action. One sudden explosion from Junior could loosen her grip and/or equilibrium, leading to tragedy for all concerned. Still, she looks fairly relaxed – more relaxed than the baby, at any rate, who seems close to madness. Modern parents labour under the misapprehension that sun-bathing should be conducted outdoors. ‘Nonsense!’ cries Sir Frederic. 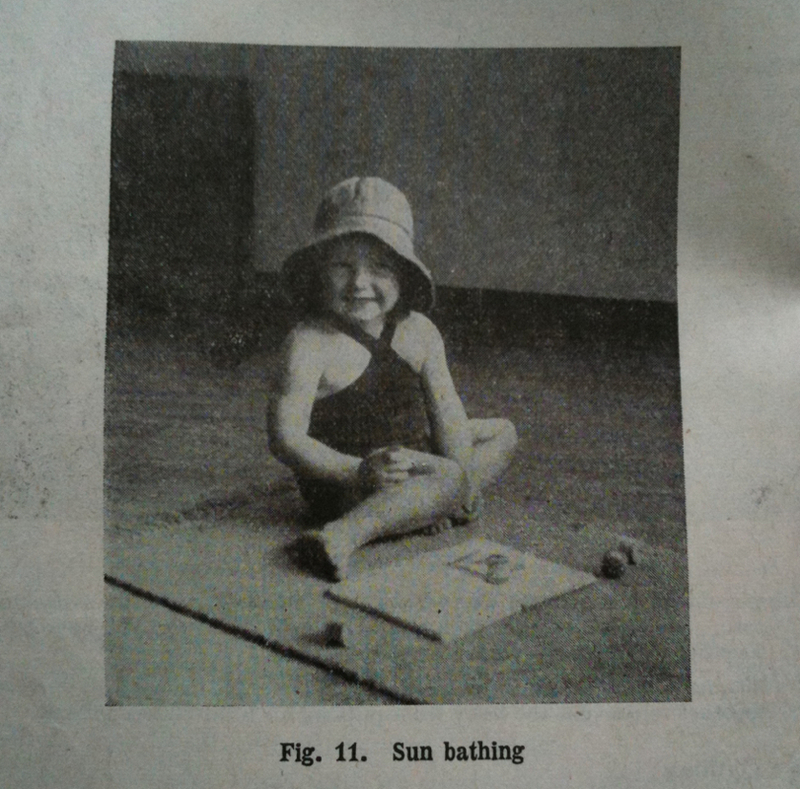 A child can sun-bathe perfectly well in a vast, empty sitting-room, provided they have taken the precaution of wearing a suitable hat. Gah. That four-hour chart is making me all twitchy. Take some exercise, have a bath and go to sleep. You’ll feel better. 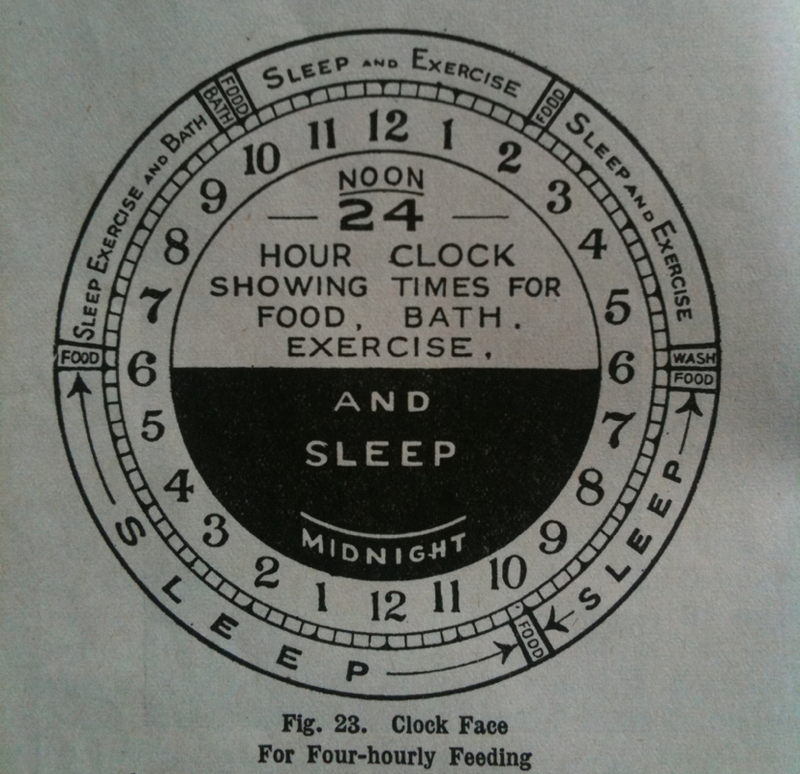 I loved the four hour clock, where couldnt Mothercare have sold those a few years ago…TV nanny claire verity would love this if it just pointed out that the hours of sleep could be in sub zero temp, with the baby wrapped in a newspaper… if necessary. p.s. oops, please insert “Twenty” in front of “four”. thanks.